I’d best first tell you about my disasters of last Saturday. 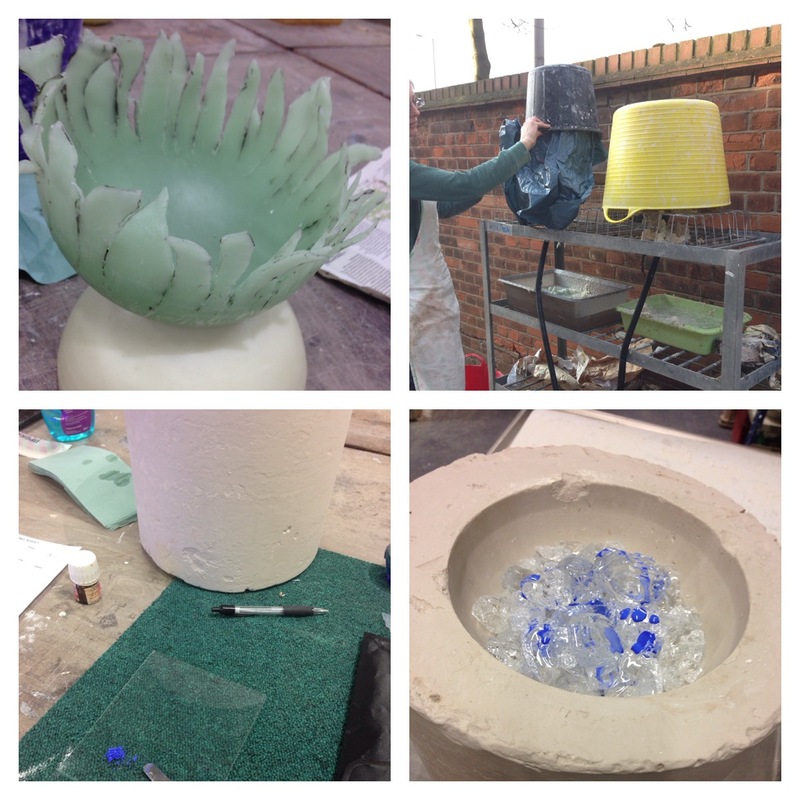 Having spent an age crafting, cutting, shaping, etching the wax model. 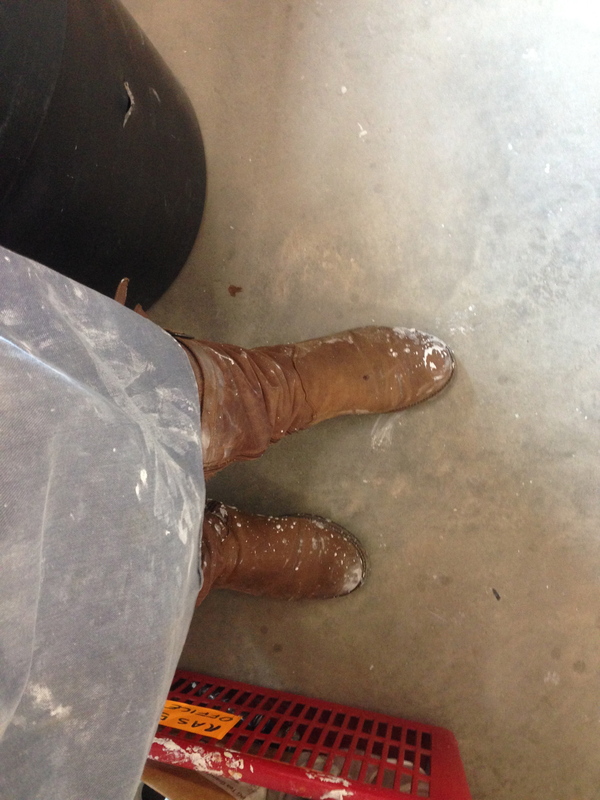 The next step is to create a plaster mold. No mean feat for a small object but something of this size it’s a huge task. I found the right plastic edging and clipped it together, using clay, I set the plastic edging to the board and hoped it’d take the weight of the massive amount of liquid plaster and flint. And it probably would have done absolutely fine had I not heard someone suggest I move the clip out of the way. Quick as a flash I did and quicker than I could imagine the plastic edging slipped closely followed by a fair bit of the 8 litres of liquid plaster! Thank heavens for sensible people in the room who quickly were able to stem the flow and save the day. What an idiot I am. All week I’ve had nightmares about it and honestly I have no idea if the plaster mold has really worked at this point. But the glass must go on. The next step was steaming out the wax from the plaster mold. It’s a little Heath Robinson but it works (top right). As there are some very thin pieces of wax, I steamed it for quite some time to get right up into the plaster mold. Today’s step was to finish steaming out the wax. Then select the glass (Gaffer) and, in my case, liquid enamel. 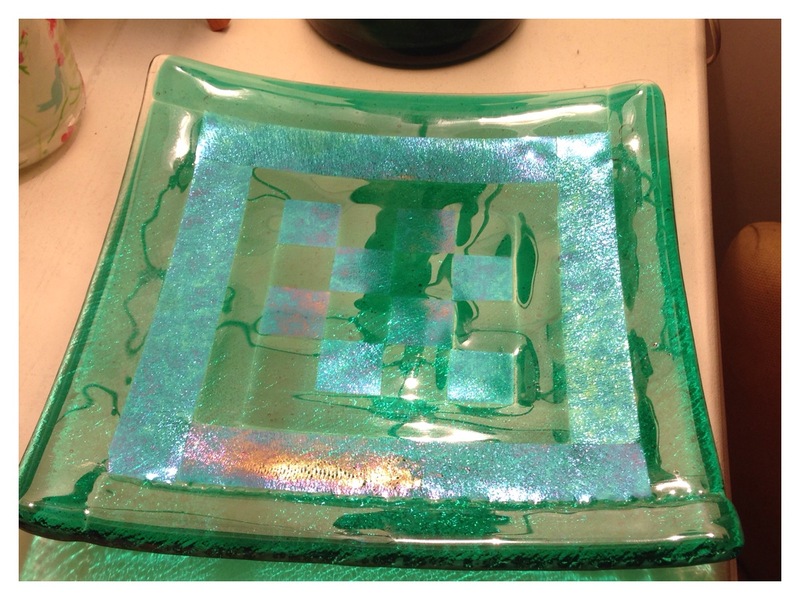 Clean each piece of glass and then position the pieces with the enamel into the mold for firing. Fingers crossed, one more time, that the firing goes well. Another small piece that I started last week and finished this week was a small ‘wonky’ bowl with some small hearts and a ribbon stand. 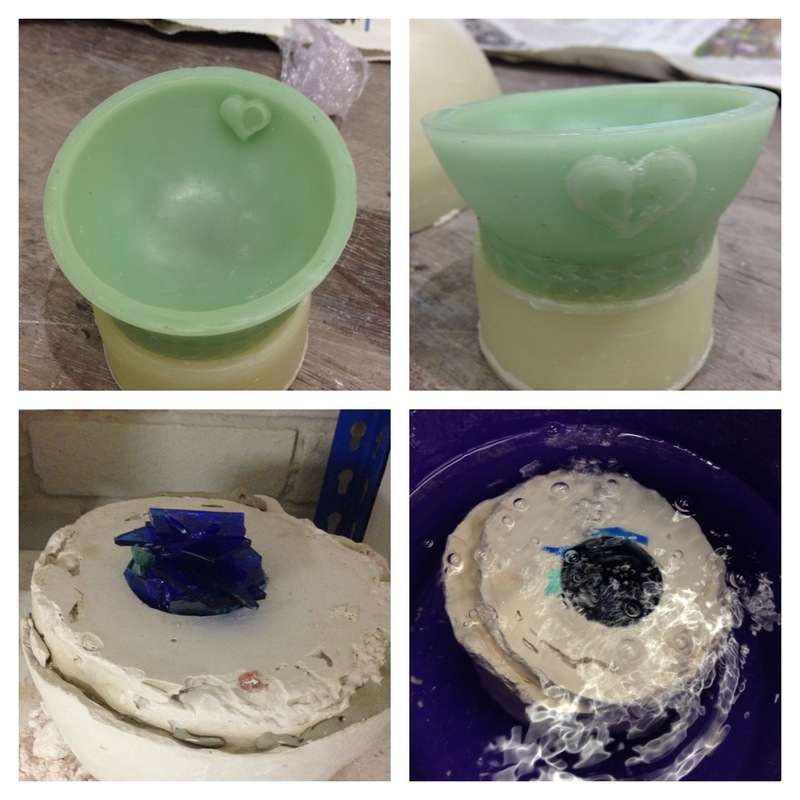 Below is a picture of the wax mold and then after the firing whilst it was still in the plaster mold. A fair bit of cold working on the saw to remove the base, lathe, flatbed, hand lapping and engraving inside and out. I’m quite pleased with how it’s worked out. It’ll be a beautiful birthday present for someone special very soon. I also was able to fuse some pieces of glass that I cut a couple of years ago, following my course with David Mitchell. 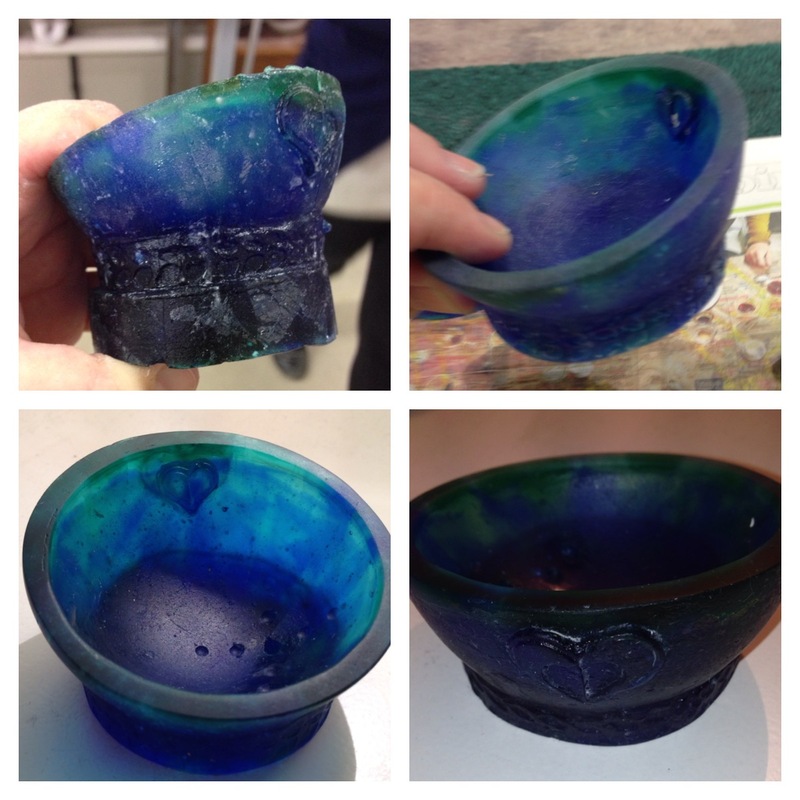 It was fired first flat (fusing) and then fired again this week in a slump. I’ve learned more in that I need to be more careful when using ‘batt wash’. Batt wash is used over ceramic molds before firing and needs to be approximately 7 layers, straight across, diagonally, and again. What I learned was that I should made each layer thinner and with more care… there’s a few small blobs on this piece because of it! 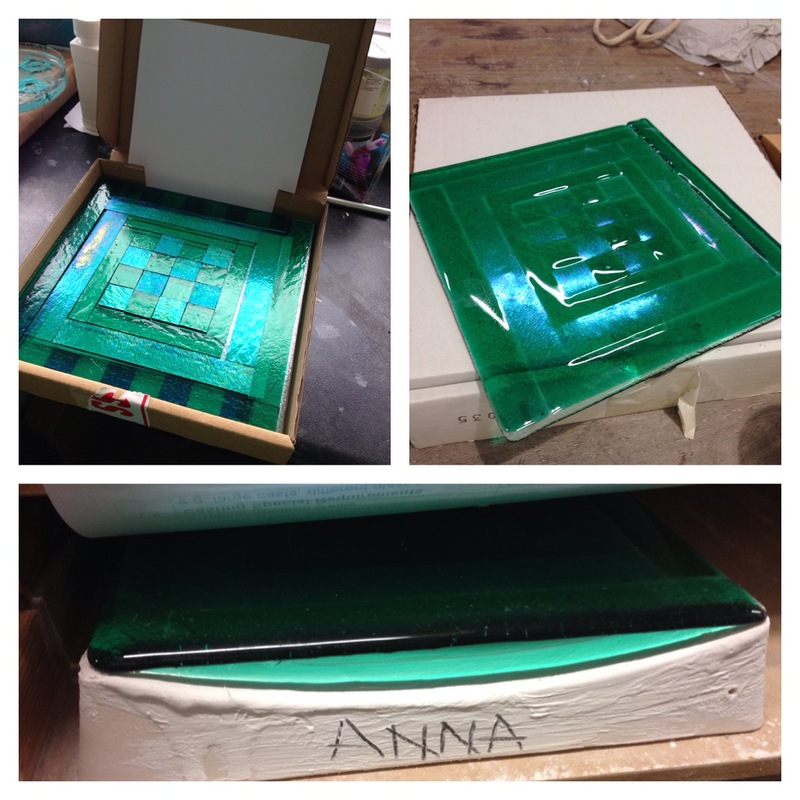 This entry was posted in Home, Living and tagged Bucket List, Colour, Crafting, Glass, Home; by AnnaGoAnna. Bookmark the permalink.